The Pacific islands are famous for growing fresh ginger, but Fiji was definitely “ginger heaven”. My friend Karson and I went to the fresh food market, open 27×7. The vendors even sleep under their tables, to not lose their stall! The sight of huge piles of thick ginger, lush green herbs, bags with colourful spices and beans, I will never forget, it was a feast for the eyes! This inspired me to make this exotic soup. In a large pot, bring the chicken stock to a boil. Chop the onions and celery stalks roughly. Add to the boiling stock. Remove the centre from the capsicums. Cut in big chunks. Add to the soup. Peel and grate the ginger. Add to the boiling soup. Let it boil for 30 minutes. Check with a sharp knife if the vegetables are soft. If not, let it cook for another 5-10 minutes. Check again. 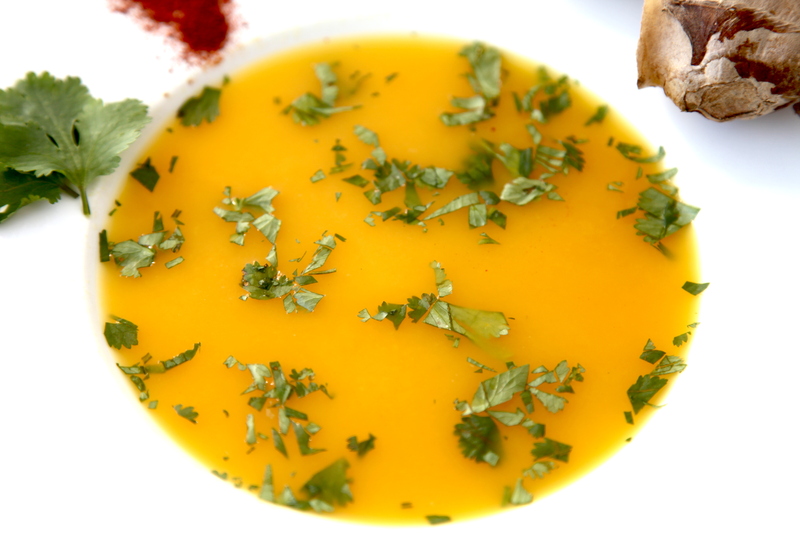 With a hand blender, mix the soup for 5 minutes until you have a thick and even blend. Sprinkle the coriander on top. Serve with bread, topped with cream cheese. © Magali Schockaert and Gourmetonboard.com, 2012. Unauthorized use and/or duplication of this material without express and written permission from this blog’s author and/or owner is strictly prohibited. Excerpts and links may be used, provided that full and clear credit is given to Magali Schockaert and Gourmetonboard.com with appropriate and specific direction to the original content. Looks real good! I have a great minestrone recipe and I’ve been looking for some other soup recipes. My father used to have a cabin cruiser and I have fond memories of summer trips cruising the East Coast U.S. Ah! the life at sea! I do have some memories of very scary moments in high seas… Wishing you smooth sailing.